I don’t know about you, but being stuck in the same beauty look for months or even years can get boring. There is nothing wrong with knowing what you like and sticking to it, but sometimes doing something out of the ordinary is just what you need. Even just a small switch to your norm can make all the difference to add a little extra some some to your morning routine. If you are in a rut, it can be difficult to branch out, especially when it comes to something trendy. But you want to make a noticeable change, so how do you find that balance with your beauty comfort zone and the desire to do something new? The easiest way is to take it step by step and keep it subtle. You can always slowly build up to something that will make a statement. And you can make this change in any number of ways: your hair, makeup, or even your accessories. When you catch yourself in a mirror with a new look, you will be struck with a newfound confidence. If your new look isn’t your favorite one, experimenting with beauty is always fun. Who doesn’t like trying new things? Start with switching up your lip color to something a bit brighter. If you normally wear a "my lips but better" shade, just reach for something a touch different. This is probably the easiest way to make a minor change in your look. But if you really want to make a statement, go for an orange lip. That does not mean you have to rep a prison jumpsuit orange on the lips, a reddish orange or a peachy shade can give you that pop of color without going too far away from what you are used to. The key here is to keep the rest of your look monochromatic. Go for a neutral eye, strong brows, maybe a winged liner, and even a browny blush. You can also keep your outfit in a neutral color family for your orange lip to make a true statement. Go glossy with your look. For ages, it seemed like matte was in for the eyes, the skin, and even the lips. But the glossy look is no longer only for editorial looks, you can make it wearable with products you probably already own. And you can make this work without looking oily, greasy, or too shiny. You just want to keep the gloss in the right places and your skin will catch the light making you glow like a goddess. Adding shine to your look means keeping things more on the natural side. This will help you achieve that "lit from within" look rather than the "I’m sweating" look. Start with a light coverage product like a tinted moisturizer. Then follow up with cream blush and bronzer for a bit of color. As for the gloss, you can reach for a liquid highlight to pop on the top of the cheek bones, the tip of the nose, and the cupid’s bow. Then to add the glossy look to your lids, a champagne cream shadow will do the trick while hanging around all day. And apply some of your favorite lip gloss to complete your new look. If you tend to get oily throughout the day end, use a setting spray or a bit of translucent powder around your t-zone. Colored mascara has had its moments throughout beauty history and it is making yet another comeback. This may be the easiest way to subtly alter your look without wowing yourself too much. Choose whichever color you like, perhaps something that makes your eye color stand out. Blue is ideal for brown eyes, purple for green, and maroon for blue eyes. And if you really want to keep it subtle, stick the colored mascara to the lower lash line. You can even use the colored one over a black or brown mascara to make your eyes pop without drawing attention. Go for a new hairstyle. You can simply switch up everyday’s loose waves for a more tightly curled look or even dig up your old straightener. Or learn how to do a new braided look or just go for an updo if your hair is always down or vice versa. It is amazing how changing up your hair can shake up your whole look. If your hair is always down, pull back the front in a half-up look, and see how your face is lifted and brighter. And if your hair is always up, make it into a braid or curl the ends of your ponytail. You can even pull out a few baby hairs around your face to add a little texture. Glasses are not just for seeing better. They can offer an entirely new style to your look. You can find tons of prescription free styles for a super affordable price on sites like ASOS, Firmoo, and Amazon. You can try out all sorts and see which suits you best. You can go for a retro or classic look with wayfarers or aviators. Or pick thicker clear frames for an updated look. Cat eyes, wire frames, round tortoise shell print; the options are endless. And other than sliding glass over your ears, you really don’t have to change anything else. 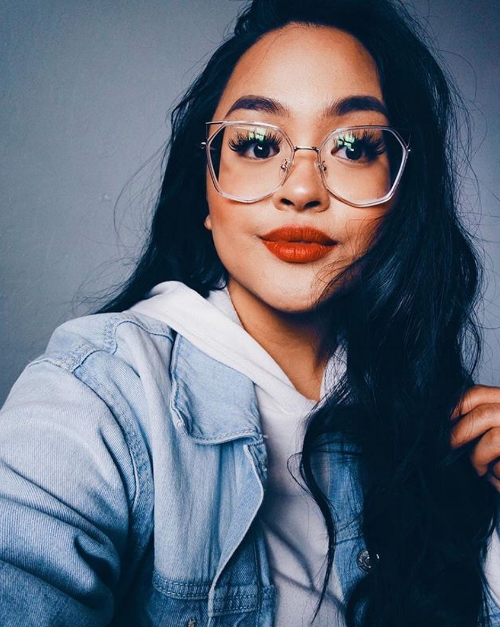 A simple accessory such as glasses can really show off your personal style in a new way. Especially for those who maybe aren’t the most talented makeup artists. What kind of change are you looking for in your beauty routine? Need a bit of color? Want to draw attention to your eyes? Or maybe frame your face with some curly tendrils? You don’t have to go through an extreme makeover to shake up your look. Just change one thing or maybe two, and see how you like it. You can always go back to what you’re used to, but trying something new can’t hurt.